Watch the following video below to learn how to set up an email alert each time the form is submitted. From the Form Designer, expand the Post Processing menu in the toolbar and choose Notification Email Alerts & Approval Workflow. Click the Add Notification Profile button. 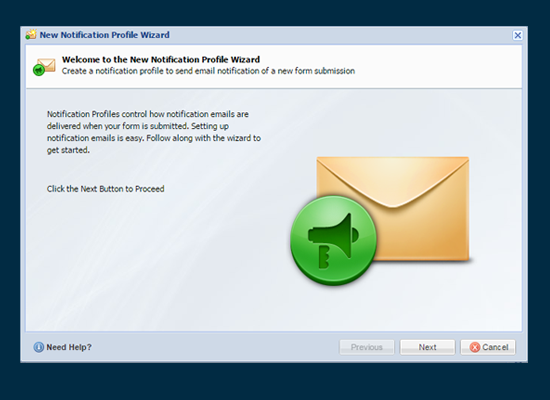 The New Notification Profile Wizard opens. Choose Standard Email Notification, then click the Next button. Enter 'New Event Registration' as the Notification Profile Name. Click the Next button. In the Recipients field, enter your email address. If you wish to send emails to more than one person, enter multiple email addresses as a comma separated list. Enter forms@logiforms.com as the From Address. You can enter your own company email here as well; however, the Recipients (To address) and From Address should not be the same as some mail servers will not deliver mail to and from the same address. The Notification Email Editor opens. Type 'A new registration has been received. Please find the information below.' and add a line break by pressing the <ENTER> key. To include the values from the form, click the wildcard icon in the toolbar, then choose Insert All Wildcards. Select the Auto Update check box, and then click the Insert button. Click the Save button to close the Notification Email Editor, and then click the Finish button to complete the setup of your Notification Profile. Now, each time the form is submitted you will receive an email notification to the email address entered. Because we used the Insert All Wildcards option and choose 'Auto Update,' any fields we add to the form will automatically be included in the email.